Marriage is more relevant today than ever before in history. Marriage used to be a given. Now it is a choice. All the old arguments for marriage have fallen away, and we are left with only one true reason to get married. We can finally get married for the right reason. So we can live together. As you pointed out in your question, this reason no longer applies to the many couples who live happily together without getting married. So we can have children. Again, it is possible to have children and be wonderful parents without getting married. To make a solid commitment. That’s a charming one. We are getting married to make it harder to walk away from each other. How romantic. To make our relationship official. You could achieve that by placing an announcement in the newspaper saying, “We are now official.” You don’t need a caterer to serve gazpacho soup in a ballroom just to make it official. So what are we left with? If not to live together, to start a family, to make a commitment or to make it official, why get married? Marriage makes a relationship divine. Getting married means that something bigger than both of you is bringing you together. A wedding achieves something that simply can’t happen otherwise: G‑d is introduced into the relationship. Until they are married, a couple’s commitment to each other is a human commitment, with all the limitations of being human. We can’t see the future, we can’t know what may change and what may eventuate, and we make mistakes. The chupah elevates the commitment beyond human limitations. 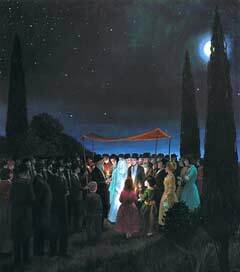 The blessings made under the chupah invoke G‑d’s name upon the couple, and bring G‑d into the union as a partner. You are married not just because you chose to be, but because G‑d has said so. Without a chupah, you can have love, commitment and family—but it isn’t holy. Only by standing under a chupah and marrying according to tradition does your union become sacred. Only after the wedding is your love blessed with the divine imprint of eternity.